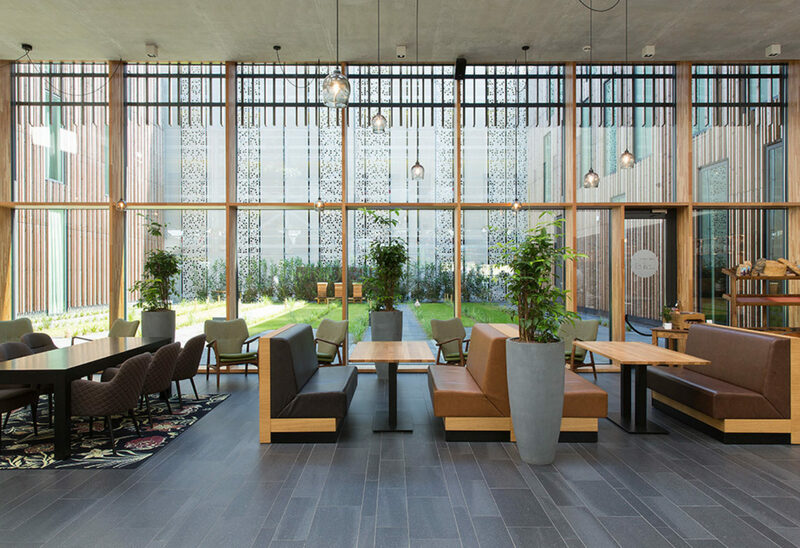 Novotel Hoofddorp by Mulderblauw architecten was given a tiled facade for two reasons, namely aesthetics and sustainability. The abstract high-gloss print of reeds on stone-satin glazing creates an interesting interplay of light and shadow. The interior of the hotel likewise features tiles by Mosa. The various colors and formats of the flooring help subdivide the space in the extensive lobby. Monochrome surfaces and the laying of tile planks in one direction generate a visual calmness and a sense of spaciousness all in once. Thanks to the diverse patterns that can be made with Mosa tiles, the contemporary interpretation of the herringbone parquet poses no problem. 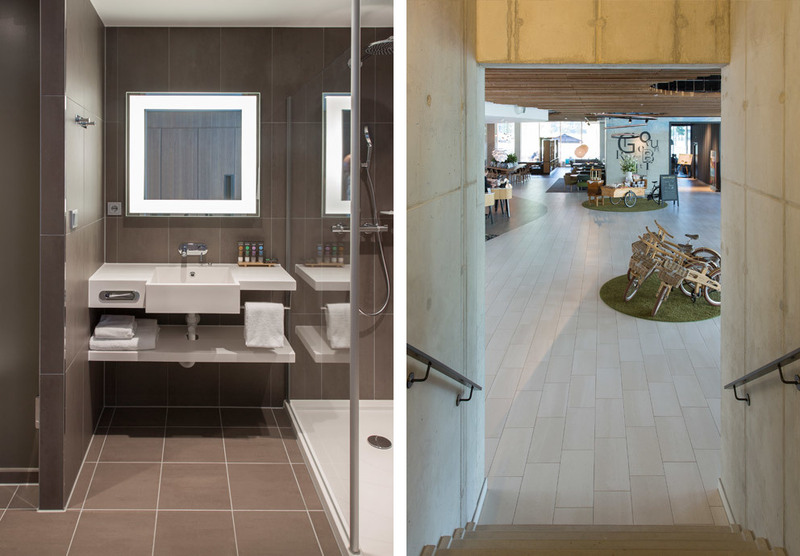 Left: At Novotel Hoofddorp all 314 bathrooms were designed with wall and floor tiles by Mosa. Right: With the natural coloring of Mosa tiles, all tiled areas in the hotel look attractively inviting. Since the early 17th century, the Netherlands has stood out as a major tile producer. The famous Delft tile managed to make its way from the small Dutch city of Delft to north Germany, Denmark and Portugal. 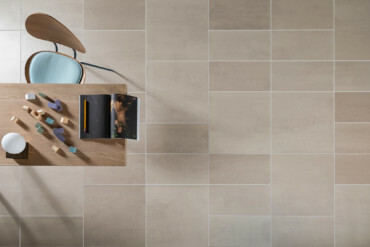 The firm Mosa, founded in Maastricht in 1883, continues this traditional artisanal craft - in the factories where it all began – and today exports some six million square meters of tiles to 30 countries annually. 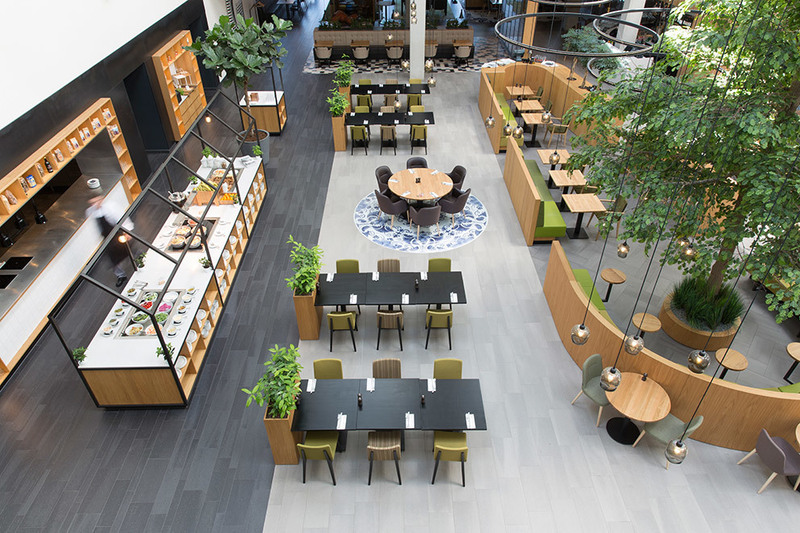 One of the latest projects in which Mosa tiles are a major feature is Novotel Hoofddorp. Here the studio Mulderblauw architecten from Zoeterwoude used tiles both for the facade and the hotel’s interior. 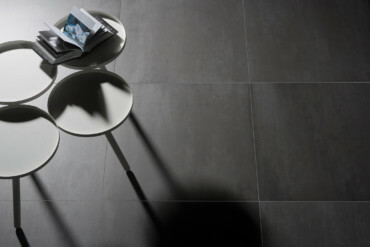 The tiles are produced in line with the Cradle to Cradle principle, meaning they are 100 percent recyclable. The goal in championing sustainable production is to take a responsible approach to using natural resources. This also means that the tiles, made of clay or sand, contain no toxins such as lead, mercury or cadmium, which can harm the environment and human health. 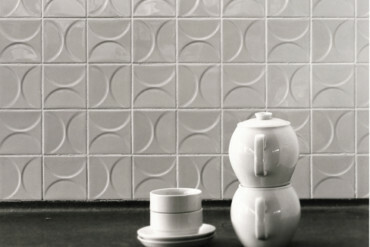 Even when in use for a long time, the tiles do not release any toxins into the environment. As such, Mosa is the first manufacturer of ceramic tiles worldwide to produce tiles that bear Cradle to Cradle certification. The tiles, measuring 60 x 120 and 60 x 60 centimeters, were inspired by the reed belt along the canals of Haarlemmermeer. 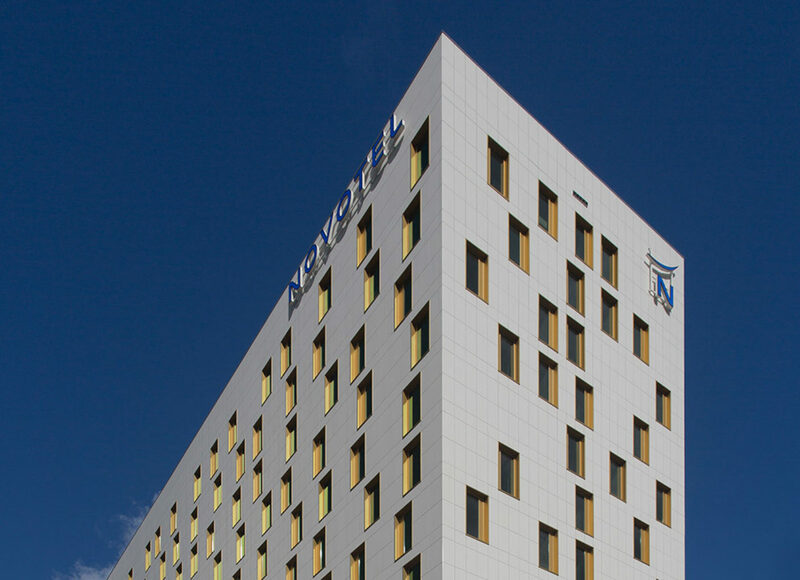 “For Novotel Hoofddorp we wanted a light-colored facade with a soft radiance,” explains architect Robert Mulder. The result is a marvelous interplay of satin and high-gloss surfaces. 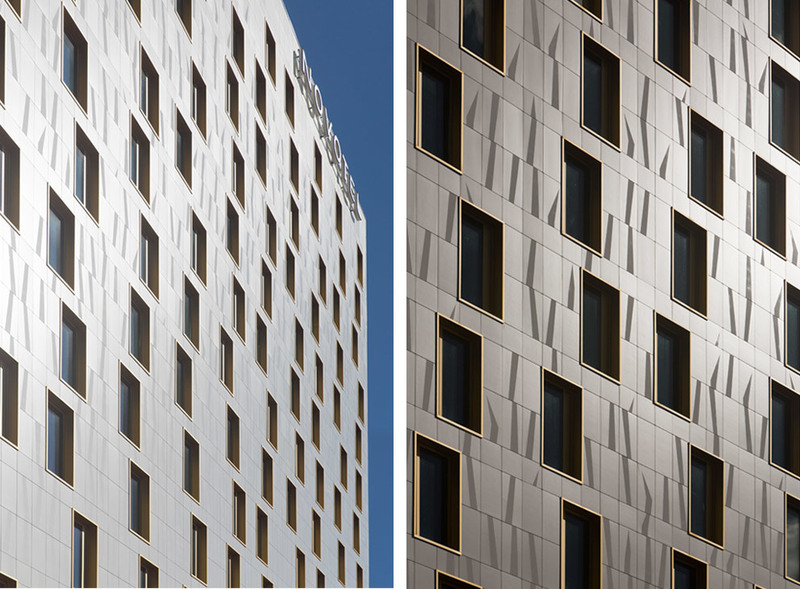 Abstract reeds “grow” up the facade, printed in a high-gloss finish on stone-satin glazing. 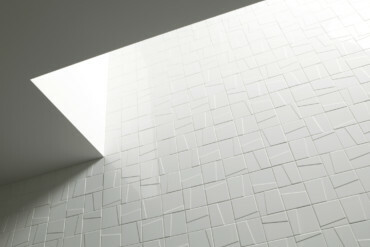 Yet the tiles not only display their own motif, but also reflect daylight. Owing to this effect, the building aesthetically melds into its surroundings despite its large size. For walls and floors inside the hotel, and above all for the 314 bathrooms, the architects opted for Mosa’s current tile collection, including the series Terra Maestricht, Terra Tones, Beige & Brown and Mosa Murals. They were able to choose between unglazed and glazed tiles with numerous decors. 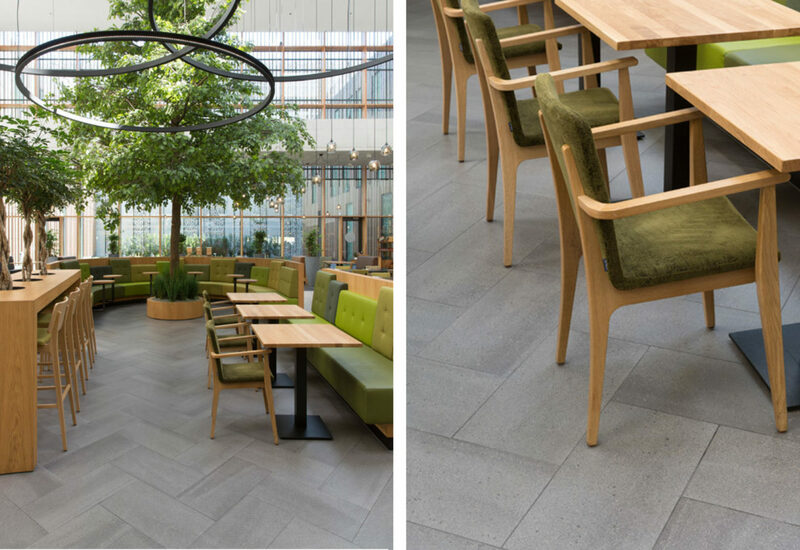 The unglazed tiles are produced using the double-layer Ultragres process, making them suitable for use both indoors and outdoors. Whereas the upper surface is particularly abrasion-resistant, easy to clean, and frost-proof, the underside guarantees high strength, excellent dimensional stability, and optimum bonding with all suitable tile adhesives owing to a water absorption level of 0.3percent. The glazed wall and floor tiles are double-fired and feature a ceramic glass layer. They are low maintenance, abrasion-resistant, and highly versatile.